Lauder is a village located 22 miles (35 km) south of Edinburgh, in the old county of Berwickshire on the Leader Water. A Royal Burgh (1502), it was the site of the 1482 hanging of six favourites of James III by Archibald Douglas, Earl of Angus ('Bell-the-Cat'). Its church (1673) is shaped like a Greek cross and was built by Sir William Bruce (1630 - 1710) for John Maitland, the only Duke of Lauderdale (1616-82). 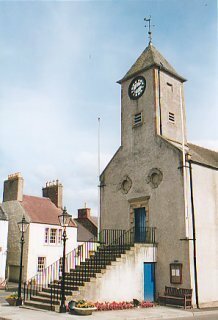 The prominent 18th-century Tolbooth or Town Hall included the prison until 1843. The village has been extended to the south in the early years of the 21st C. and a new 250-pupil primary school was completed in 2007 at the cost of £2.4 million. The American industrialist Thomas Dickson (1824-88) had his roots here and the missionary Rev. John Wilson was born nearby in 1804, while the defiant Rev. James Guthrie (1612-61) was for a time the parish minister. The Common Riding in Lauder is one of the oldest in the Borders, dating back to at least the 17th C. It takes place annual at the end of July, led by a young man known as the Coronet. Northeast of Lauder stands the red sandstone Thirlestane Castle (c.1590), seat of the Earls of Lauderdale and superbly decorated with a large art collection.